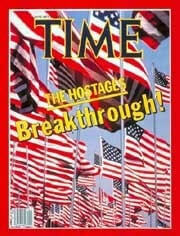 In January 26, 1981, the cover of Time Magazine featured a photo taken at the Avenue of 444 Flags (cover image used with permission). That was the first issue of Time after the release of the hostages who had been held hostage in the U.S. Embassy in Tehran for 444 days. That cover was a tacit acknowledgement of the Avenue of 444 Flags as a symbol of the endurance and persistence that led to the release of the hostages. Since then, 444 flags have continued to fly along the Avenue as a tribute to all veterans and as a reminder that freedom isn’t free.